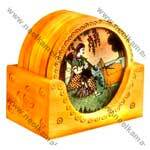 Our wide array of Wooden Handicrafts includes Wooden Boxes and Coaster Set. Our range is manufactured using high-quality wood and modern machinery as per the set industry standards. Wooden Handicrafts are offered in different sizes, designs, and patterns. They are hand carved with excellent finishing. Wooden Handicrafts are offered by us at market leading prices and supplied within the due time.